Mike entered the ONE80TC program in July, 2017. Having served in church, led the youth, Mike knows where he wants to be and that is back to the roots of what he is proud of. 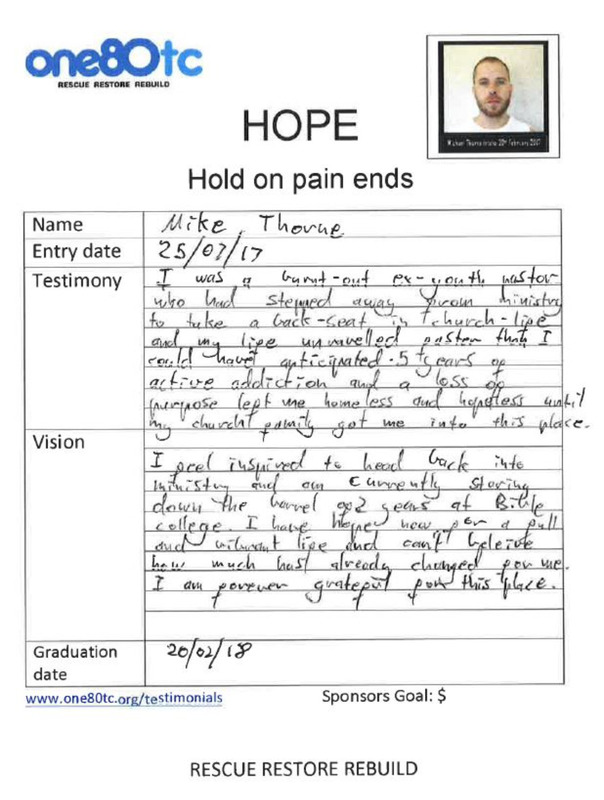 It costs approximately $50,000 to put a student through our full time 12 month residential program and Mike has generously offered his story to help gain support. Please click one of the following riders to pledge support for Mike and the amazing group of guys that have come with them. David Singh (Target $2,500) Click here to sponsor me. Chris Burns (Target $3,000) Click here to sponsor me. Matthew Moy (Target $2,500) Click here to sponsor me.